Published: Thursday, June 18, 2015 | 4:18 p.m.
Whistling Straits is perched on two miles of uninterrupted shoreline on Lake Michigan. What once was farmland and later Camp Haven – a 1950s anti-aircraft training facility for the U.S. Army – is now one of the world’s most spectacular golf venues. Founded in 1998, Whistling Straits emulates the great old seaside links courses of the British Isles, invoking an image of the game founded more than 400 years ago. The Straits course is open with rugged and windswept terrain. Having enlisted renowned golf course architect Pete Dye to build the course, Herbert V. Kohler Jr. walked the site during its early construction. It was during that walk on a particularly gusty day that Kohler, Executive Chairman of Kohler Co., arrived at a name for the course. A north to south gale was whistling along the bluffs, while white caps broke on the rocky shoreline - the straits - of Lake Michigan. In building Whistling Straits, Dye followed his employer’s wishes to make the course reflect the origins of the game of golf. Under Dye’s direction, more than a million tons of cubic earth was moved. In addition, 13,126 truckloads of sand (approximately 80,000 cubic yards) were transported to the site. Today, the course comprises more than 1,000 bunkers. Eight holes hug the shoreline of Lake Michigan, while a view of the lake is visible from all 18 holes. The average green at Whistling Straits measures 7,500 square feet and the average tee some 6,000 square feet. All the accoutrements of the ancient game are on display at Whistling Straits: bluffs and massive sand dunes, stone bridges, natural fescue fairways, 14 water hazards and significant elevation change – the 15th hole is approximately 80 feet above sea level. A flock of more than 40 Scottish Blackface sheep wander the property freely I knew I would like the place, right?) as they would on a country course in Great Britain. The sheep are kept on site during the golf season and have a home at an offsite farm during the winter. In August 2004, The Straits joined an elite roster of U.S. courses by hosting a major golf championship. Vijay Singh’s playoff victory in the 2004 PGA Championship and a 2007 U.S. Senior Open triumph by Brad Bryant firmly imprinted Whistling Straits as one of the most memorable venues in major championship history. In 2010, Martin Kaymer battled Bubba Watson to become the first German to win a PGA Championship. It was a finish no one will forget. Once again, the Straits will welcome the world to Wisconsin as it will host the 46th Ryder Cup in the fall of 2020. Nature’s constant contribution at Whistling Straits – the wind – provides the true challenge of mastering the course. During the 97th PGA Championship, the world’s premier players will face a predominant southeast wind that will gust between 10 and 30 miles per hour. Whistling Straits’ ability to challenge the world’s greatest players has ensured its rightful perch among the world’s most unique courses. This is Clarke, Gill, Trish and me in September 2007 at the Championship course. At the Straights, there are: the main Championship course and the Irish course which runs alongside the Championship course; at Blackwolf Run, there are the River Course, and the Meadows course. We played the first three courses. 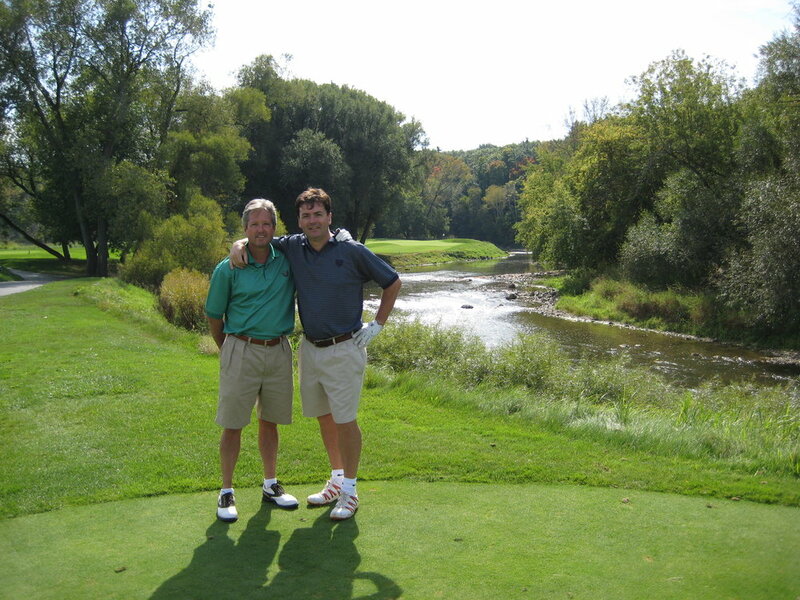 Clarke and me at the River course. I think there's a fisherman in the background who was in danger every time we teed off.. I think this is the 18th at Whistling. How to get there: fly into Milwaukee, hire a rental car and drive an hour north. We did not stay at the Club as there was no availability, but we stayed at an ok hotel - I think The Days Inn - about a 30 minute drive from Whistling Straights. It's not expensive to play relative to other great courses around the States. Expect to pay Greens Fees around $250 and caddies are getting another $100. I really enjoyed the courses. I thought the Championship course a real test. If the wind is blowing off the Lake, look out! More than 130 years ago, 29-year-old John Michael Kohler took a cast-iron water trough, added feet and enameled it, creating a bathtub. According to Kohler Co. lore, he sold it to a local farmer for one cow and 14 chickens. This seemingly simple innovation launched the KOHLER brand as a household name – for kitchen & bath, power, interiors and golf & resort destinations. Believing "A worker deserves not only wages, but roses as well,” Walter J. Kohler – son of John Michael Kohler and second president of Kohler Co. – undertook an ambitious project to house immigrants for just $27.50 a month, including a private room, laundry service and three meals per day. The project, a Tudor-style building he named The American Club, opened its doors to single immigrant workers in 1918. Along with a pub, bowling alley and barbershop, The American Club offered lessons in American citizenship and the English language. Surrounding The American Club, the newly incorporated Village of Kohler was part of a 50-year master plan created with the Olmsted Brothers, designers of New York’s Central Park. One of the first planned communities in America, it brought community members together with everything from bowling leagues to picnics at Ravine Park and concerts by John Phillip Sousa. As time passed and the Kohler Co. grew, so did the needs of workers, many of whom now had families and their own homes – often built by the company and sold to workers at cost. Eventually, The American Club outlived its original purpose and was in need of major repairs. Herbert V. Kohler Jr., current president of Kohler Co., conceived the idea of an elegant village inn. He hired three consultants, all of whom said the idea would never work. Undeterred, he trusted his instinct and launched a renovation. When The American Club was placed on the National Register of Historic Places in 1978, there was no turning back. In 1981, The American Club was reborn as a world-class destination, preserving the history of yesteryear while offering the gracious hospitality and single level of quality that remains a signature of Kohler to this day. The resort now includes four award-winning Championship golf courses at Whistling Straits® and Blackwolf Run®, proud host of the 2004, 2010 and 2015 PGA Championships; the 2007 US Senior Open; the 2020 Ryder Cup Matches; the Andersen Consulting World Golf Championships in 1995, 1996 and 1997; and the U.S. Women’s Open in 1998 and 2012. It’s also home to nine distinctive restaurants, boutique shops and Kohler Waters Spa – one of only 47 spas in the world to claim Forbes Five Star distinction. Nearby, River Wildlife, a distinguished wilderness preserve and dining club, encompasses more than 800 acres of unspoiled land, 7 miles of the meandering Sheboygan River and more than 30 miles of scenic woodland trails. Like everything at KOHLER, River Wildlife exemplifies Kohler Co.’s commitment to caring for the environment and seeking innovative ways to protect our resources. And halfway across the globe, The Old Course Hotel – bordering the renowned 17th Road Hole of the Old Course at St Andrews – continues the story of Kohler hospitality and gracious living.